I’ll be posting more about this book when it gets closer to the pub-date (January), but I’ve been helping to fact-check a friend’s book, New York Diaries: 1609 to 2009, and it’s just so fabulous I had to say something now, even though you can’t buy it yet. Teresa Carpenter has researched 400 years of diaries about New York and pulled out a selection of entries. I haven’t even seen the whole thing yet, but in the pieces I have three things happen that make it un-put-downable for me: you get all these different points of view of a city as it evolves over time, coming from an interesting collection of people both famous and not famous, picking up information about them, the city, history, it’s just gripping. I’ve been passing by this vacant lot over the years as it has become more and more overgrown, and it was just cleared out, except a few plants here and there, like this monster thing. Does anyone know what this is? I’m so sad. I liked its wild, Secret Garden-like ways. This looks like a Princess Tree (sometimes called an Empress Tree). 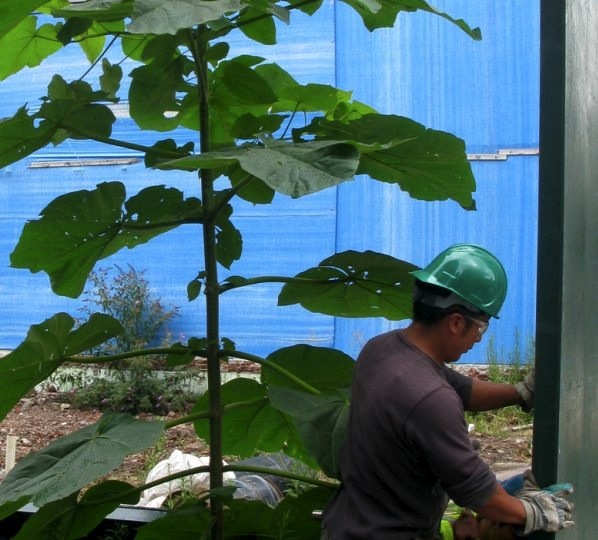 The technical name is Paulownia tomentosa. Looks like burdock or greater burdock to me. Or Princess Tree… I really don’t know…….. I think you both should fight to the death, that will decide it.